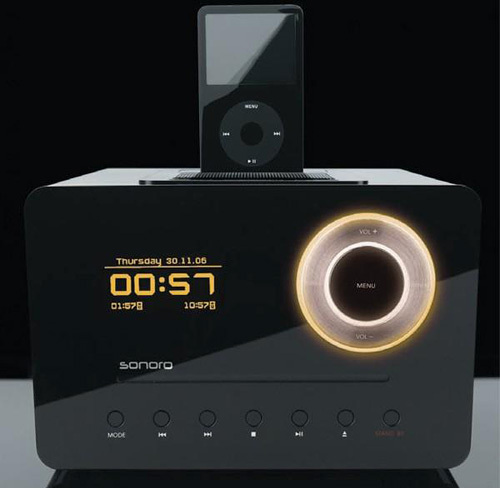 Sonora Eklipse CD Clock Radio With iPod Dock | OhGizmo! So, does someone want to help me figure out how and why this CD clock radio from Sonoro costs a whopping $550? Let’s see, it’s got a slot loading CD player that’s MP3-friendly, nothing special there. A ‘top-quality’ AM/FM radio, not exactly a bleeding edge innovation either. An iPod dock that will also recharge your player? Hmm… Well I guess if you haven’t set foot in an electronics store in the past 10 years this might seem like a technological breakthrough, but other than that, I’m hard-pressed to find a reason why anyone would drop $550 on this thing. Oh wait, I didn’t notice the shiny black finish and glowing accents! Now I get it! Here's the real kicker: looking at the screen, it's obvious that this is just a reshaped and up-priced Luna X2 with a slot-loading CD thrown in. Cost of the X2? $130. Ahem! It's Sonoro not “Sonora” ! Sonoro is a famous in Europe of it's high quality products. Those mono clock radios produce mega bass and they have really powerfull radio tuner. Sorry, i think this looks amazing, if you'd like your home electronics to look attractive. If it drops under $400 I'll get it. Compare its price to a Tivoli system and it's not bad. why are these so expensive, do they sound amazing?